Experiencing a divorce can make your dog depressed. Divorce is a painful process, and not just for people -- it can negatively affect your dog, too. The stress of the process and the uncertainty that follows is disrupting to your dog's life, so remember to prioritize his feelings. After all, he has needs, just like you. The stress of a divorce -- whether it's actively being pursued or simply on the horizon -- takes its toll on a dog. Dogs are highly attuned to emotion and mood, so when you're anxious, depressed or angry, your little buddy knows it. If a breakup or divorce is marked by arguments, fighting and high tension, your dog may start to feel negative emotions, as well. He may become frightened, anxious or depressed if the mood in your household doesn't improve. Moving is difficult for a dog even when the whole family moves together. If you and your dog move and leave a co-owner behind, your dog may be confused and anxious. His new environment and loss of an owner may leave him with a condition like separation anxiety -- after losing one of his people, he could be afraid of losing you, too, as well as being left alone in his strange new environment. Your dog could lose more than an owner in the divorce -- he could lose a brother or sister. 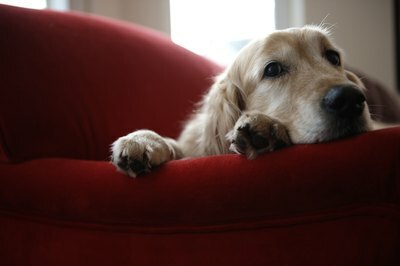 If you share more than one animal and split them up in the divorce, the loss of a companion can be devastating to a dog. The emotional stress of losing his friend can leave your dog depressed or uneasy, because he doesn't understand the nature of the split-up -- only that he doesn't have his best buddy around anymore, and now he's lonely. Dogs need routine and consistency in their lives, and divorce can completely disrupt your dog's accepted way of life. If one person retains sole custody of the dog, the dog may have to adjust to a new schedule for feeding, walking and alone time. If you share custody with your ex, then the dog's schedule could change every week. Try to maintain as much consistency in your dog's routine as possible, even if it means coordinating his schedule with your ex. Petside: What Happens to Pets After Divorce? Cesar's Way: Who Gets the Dog After a Break Up? What Is a Good Age to Stop Bottle-Feeding a Puppy? How Many Hours Can a Puppy Be Left Alone? Is There a Way to Disinfect Aquarium Stuff? Does Age Affect Weight in Cats?